RESOLUTE SUPPORT HEADQUARTERS — In honor of International Women’s Day on March 8, 2018, Task Force Southwest (TFSW) wants to highlight Lt. Col. Elizabeth D. Perez. 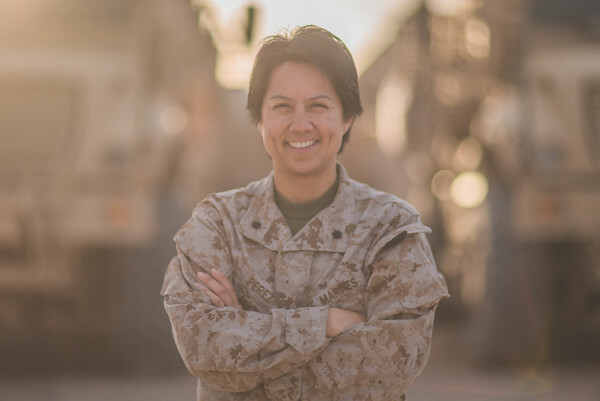 As the chief of staff, Perez is the senior-most female among the group of approximately 500 service members currently deployed to Helmand province, Afghanistan. Q: Can you briefly describe your role in TFSW? A: I ensure the commanding general (CG) gets the information he needs, when he needs it. To do this, I confirm the staff understands his intent—in partnership with the operations and plans officer—and that they collaborate with another; I interface with higher and lateral units; and I receive feedback from the CG. A second, equally important part of my job is to develop and mentor the staff, who are the Marine Corps’ next generation of leaders. Q: What’s your Marine Corps background, and how did it help you prepare for your current role? A: I spent 12 years on active duty, resigned my commission, missed the Marine Corps, and became a reservist. I have been fortunate to have had mentors throughout my professional career, both military and civilian and even here on the Task Force, who have unselfishly and unilaterally plucked me out to share their experiences, knowledge, and tips on leadership. As the chief of staff and a logistician, I refer to my experiences dealing with stakeholders at the Pentagon and at Cisco (my civilian employer), the business knowledge I gained from my Naval postgraduate education, and the tactical leadership opportunities I was first exposed to as a lieutenant and young captain on a daily basis. Looking back, those early years were invaluable and set the foundation that serves as a reminder for me today that decisions you make and your leadership style have an effect on the people on the ground. It’s the difference between whether or not we accomplish the mission and we have a good time at work. Q: What would your advice be to female service members and women looking to enter into the military? A: My advice is to be true to yourself, follow the Golden Rule, and always take care of your Marines, whether they are your enlisted or junior officers. You can never go wrong if you do those three things. The Marines and Soldiers with Task Force Southwest are training, advising, and assisting the Afghan National Army 215th Corps and 505th Zone National Police. The Afghan National Defense and Security Forces are conducting offensive operations to expand the security belt around central Helmand province and deny the enemy freedom of movement.